We believe curious people find innovative solutions. This is an integral piece of how we manage our company and what we plan to demonstrate through our blog, The power of shared knowledge. Let's just agree that when we hear numbers in the billions, we think that's big; big enough to control your destiny and the market. But something big happened to 'big. 'ﾠ Even multi-billion pharmaceutical companies know this in today's environment — but more on that in a minute. It is not that control is out, it is just that in an environment where change happens quickly, adaptability trumps control. Why is that? Because the follow up question is 'control over what? 'ﾠWhen things are moving quickly, what you worked so hard to control just may not be as relevant as it once was. Take a look at America's $3-trillion healthcare industry from the top down. A billion dollar company doesn't look any different than a start-up company with a few million in revenue from that scale. That means that even billions do not control the market; thriving requires collaboration. All sophisticated businesses now have to live by kindergarten rules, like Robert Fulghum wrote in "All I Ever Needed to Know I learned in Kindergarten." Recently, 10 multi-billion dollar pharmaceutical companies formed a joint venture to share research for the development of new drugs. They did not give up control of their existing business, but did realize the new buzz words are 'influence' and 'collaboration.' When the risk of slow creation is too high for the reward of exclusivity in a market this big, speed matters more than control. To put it in "water cooler talk," 50% of something is better than 100% of nothing. So what happens in America's healthcare system when the control of operating silo's breaks down? What happens when the downside risk is greater than the upside reward? The answer is easy: the influence of collaboration wins for those who work together. Andﾠthe view from the top of the $3-trillion tower of expense no longer distinguishes between size, and instead distinguishes between isolation and connectivity. We have encouraged this trend since revelationMD was an idea 10 years ago. We began building our business model around it five years ago with payers (employers), authorizers (physicians) and providers all working together with the common goal of using information to take better care of patients at lower cost. Now we are building our customer base with it; one collaborative relationship at a time, the way we learned in Kindergarten. The Affordable Care Act – like it or not – is a mess. So, why am I expressing thanks for the new law this holiday season? Because it forces us to examine why it is not working. There is plenty of work to do in making American's healthier. But until then, we need to face up to this formula. For decades, the healthcare marketplace has used price to try and control cost. By focusing on negotiated network discounts, variability in hospital charge masters, or a thousand other price issues, we only address half of the equation. My former business partner, Den Bishop used to call this pricing "wack-a-mole." Prices go down one place and up someplace else. Largely ignored out of frustration, attempts to influence utilization have ended in failure or market rejection. We know it failed because healthcare costs have risen 700% over the past 30 years. "Every part of the system needs to rethink the way it's working. Or maybe what I'm really saying is we need a system instead of 20, 40 components, each one having its own financial model, and each one making a profit." In part, Ms. Rosenthal is correct. Most of the healthcare industry is set up in silos, each focused on growing its business. Insurance companies, hospitals, pharmaceutical companies, imaging centers, labs, home health agencies – and so many more – are all trying to increase their share of the market with one of two messages: "you need more" or "use us and you won't need them." If you do not believe it – pay attention to how much consumer advertising is utilization based. Since most patients are detached from real cost and because the healthcare "sandbox" is $3 trillion, these silos have flourished. Price alone will not change this. We have to address the second half of the equation: utilization. But here is the greatest joy of this holiday season: It doesn't have to be that way. If we merge the silos with collaborative technology, integrate data, and improve transparency so that outcomes improve while costs drop, we will work smarter and curb utilization. Patients will win, and so will payers, and so will the high performing medical providers. And if that system is non-disruptive to employer healthcare plans and physician practices ... icing on the cake. Costs roll back and outcomes improve. Oh wait, that is what we built at revelationMD. Now it must be Christmas! Over the three decades of managed care practices, physician fees have never represented more than 30% of all healthcare expenditures, while physician care authorizations extended their influence to over 90% of all healthcare expenditures. Having built my career in the traditional managed care environment at a global health insurance company, I could not understand why the system was so focused on the fees physicians charged rather than on the care they authorized. 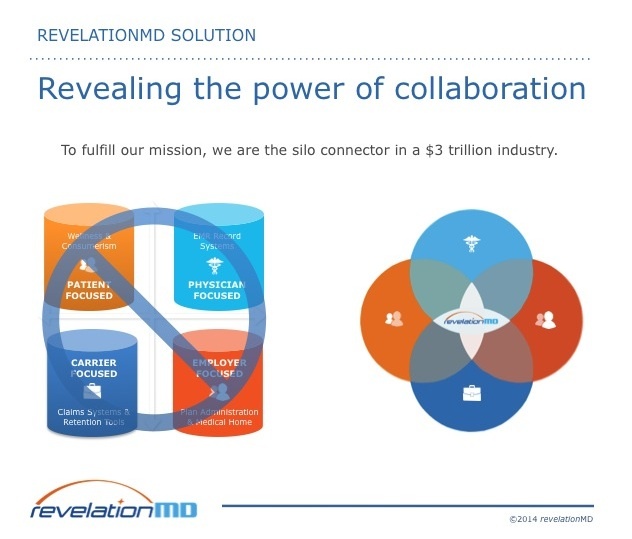 In 2003, I formed The Physician Collaboration Project with my fellow revelationMD co-founders. The project developed into a 'think tank' of all parties involved in medical delivery system (physicians, employers, technology experts, plan managers, patients) that researched and processed this great challenge. And from that think tank came the code to create revelationMD – its mission, values, and technology solution. In my White Paper, The Physician Collaboration Project, I outline how and why physician collaboration with colleagues and all parties involved in medical delivery drives value and lowers costs of healthcare. Welcome to the revelationMD blog. revelationMD’s blog is designed to encourage everyone who touches the U.S. Healthcare system. Each of us is affected by what happens next in this anxious time of transition. Have you ever tried to get directions from someone who has never been where you are going? We are in a time where literally no one has been where we all must go. The powerful in the industry are trying to secure their position and the vulnerable are trying to keep from losing theirs. I know of no historical context to guide us when so much money (+/- $3 trillion) is in play in a way that affects so many. Over 20 years ago in the early days of managed care, I wrote an article called "Who Owns the Patient." That battle rages on between the patient (consumer), the doctor (authorizer of all care), the employer (majority payer), the government (who already pays more than 50% of all care) and the hospital (the largest single recipient of money). At stake is everything we know about healthcare -- technology, access, liability, quality, delivery, administration -- and everything we care about -- life, liberty and the pursuit of happiness. In the month of March, when the entire country added only 88,000 jobs, healthcare contributed 23,000 of them. What do you do with an economic engine that is saving the country economically in one view, but choking us from another view? Solutions are beyond empowering consumers to be as knowledgeable as physicians, beyond abdication, beyond blaming any one party, and beyond our individual reach. The solution is in sharing; knowledge, data and experiences in a transparent and competitive platform. Power hides in controlled systems that keep information close. Sharing, what we learned as children and teach our children, is the best way for everyone to get along – in life and in healthcare delivery. We invite you to be part of it through our blog. We will bring you stories of triumph and sorrow; examples of where medical delivery works and where it is broken; and interactive content that seek your insights. Most of all we will strive to deliver what we stand for as a company: simple, smart, responsive, committed, and valuable answers to healthcare's nearly impossible questions. Welcome to The Power of Shared Knowledge! Among other strategic initiatives, we've been hard at work on a new website to better communicate revelationMD's impact for all healthcare stakeholders. Our URL stays the same, but our look and user experience is brand new and improved, keeping the user in mind. Copyright © 2007-2019 Physician Paradigms, LLC. All Rights Reserved. Join our email list to stay informed with healthcare news, tips, and client success stories.